Here’s a piece of classic Culture Or Trash trivia. What do the Gardens of Versailles and Wembley Stadium have in common? Answer: they’ve both hosted English National Ballet’s production of Swan Lake – which this fortnight finds a more traditional home in the London Coliseum. This ballet’s got that broad appeal. Don’t know the Tchaikovsky music? Yes, you do: just wait for that piteous, swelling F# which ushers in the bombastic theme. Remember now? Not that you need to be conversant with four acts’ worth of swooping score and dance to enjoy tonight’s majestic rendition. Heck, you don’t even have to have seen the 2010 film spinoff Black Swan with Natalie Portman. Nefarious bird/man Rothbart turns Princess Odette (Alina Cojocaru – assured of stretch and endless of rotation; a beautiful performance) into a swan. Prince Siegfried (Ivan Vasiliev – debuting the role, evidently, but possessing unstoppable power) falls in love with Odette and vows to marry her. But Rothbart manages to fool the young prince into consorting with his daughter, the black swan Odile (Odette’s evil double, also played by Cojocaru). Can Siegfried get his girl back? Optimal excuses for melodrama and for virtuoso performances, yes. 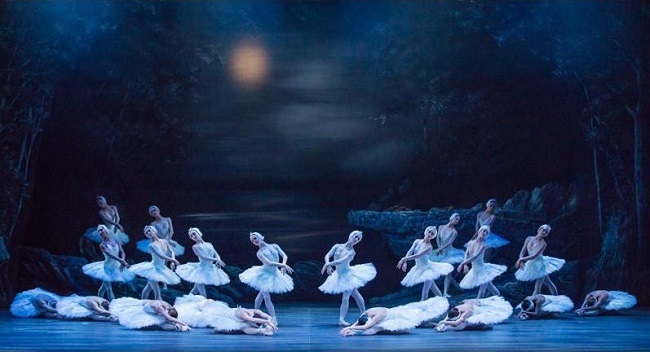 But the unsung heroes are the ballet corps – the other swans, entrancing in their ebb and flow on the lake – and the no-less-precise English National Ballet Philharmonic down below, firing through the most memorable ballet music around. It’s an oddity that, despite now being fairly ubiquitous, Swan Lake endured an indifferent reception at its 1877 premiere in Moscow. It had to be revived. Yet more intriguing is that Tchaikovsky’s sources of inspiration are almost as obscure as the reasons for the work’s initial failure. He seems to have picked and chosen the edgiest bits of Russian folklore to produce an expansive, dark fairy tale – which gathers such fearsome intensity in this version. Get in there quick.